“There is only one boss, the customer,” said Sam Walton, founder of Wal-Mart, and his quote rings true in a business world closer than ever to its customers and clients. Social networks have made customer service a very public business. Now, dealing with customer inquiries is fraught with difficulty and potential calamity should a mishap gather momentum and go viral. Companies know that they need to listen to their customers online, but effectively doing so can be difficult when customer are reporting problems and asking for help on multiple online channels. 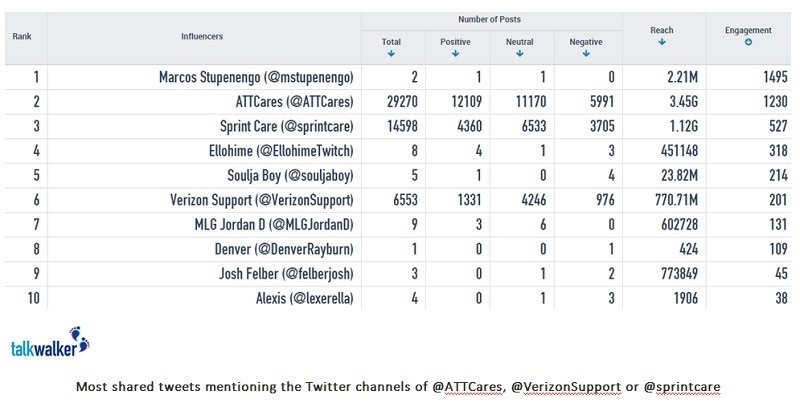 We looked into this using Talkwalker social media analytics to look at the performance of the customer service channels of AT&T, Verizon, and Sprint. The following tips will show you how to use social listening to understand your customers’ problems better and perhaps turn a potential crisis into an opportunity. 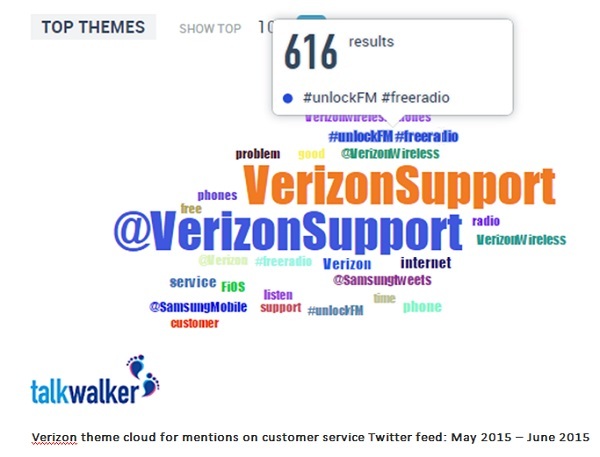 Here is a quick look at four steps to improving customer service using social listening. Understanding how your customer service channels are performing, especially when dealing with a high volume of inquiries, is pretty difficult. 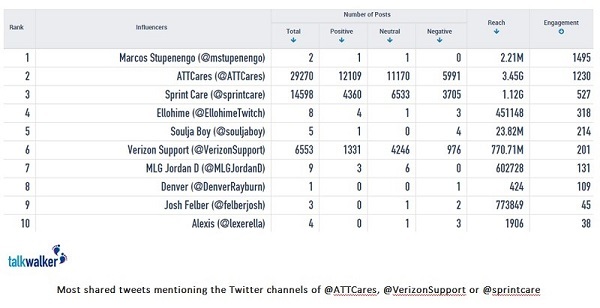 One way to measure your performance quickly is to do a sentiment analysis of your customer service Twitter feed, such as the @ATTCares account for AT&T and the @VerizonSupport account for Verizon. By comparing your own channel with those of competitors’, you can quickly see whether you are underperforming or overperforming compared to the industry standard. Understanding the positive and negative sentiment of posts on customer service channels is a good first step. But to really understand your customers’ issues, you need more in-depth analysis. One way to do this is to use a theme cloud generated based on the topics of discussion that appear most frequently. This way, you can begin to pinpoint exactly where you are going wrong. Problems on social media can often start to spiral out of control, especially if a lot of other people are having a similar experience. In the image above, we can see that @mstupenengo’s two tweets have been shared extensively, suggesting that his inquiry may be worth looking into a little deeper. By identifying which complaints on customer service channels are generating the most engagement, brands and companies can get a better understanding of exactly which problems are gathering the most attention on social channels and prioritize their responses accordingly. For a lot of large companies, multiple departments often need to work together to handle issues like customer problems. But getting information passed between departments quickly isn’t always easy, and any breakdown in communication can quickly lead to costly delays. 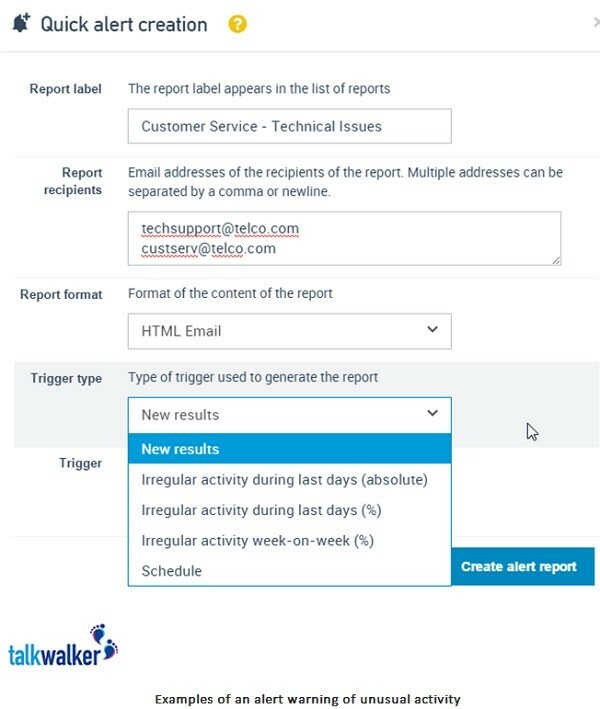 By using automated alerts that are triggered based on unusual activity around a Twitter channel or even a specific topic of discussion, relevant departments can make sure they stay on top of problems before they snowball and make sure each team gets the most current information. Every company has to deal with customer complaints. The job is never easy, especially if you are handling frustrated customers on a public forum. But social listening can help companies both understand their customers’ problems better and assist them more effectively.